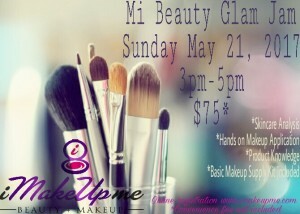 This hands on makeup class is tailored to help all women enhance their natural beauty with the use of cosmetic products. Taught by licensed esthetician and certified makeup artist Singrid Thompson, Mi Beauty Glam Jam is “jam” packed with tips and tricks to help one achieve various makeup looks, product knowledge and more. A basic makeup supply kit valued at $20+ is also included. **There will be a convenience fee added in the form of “tax” at check out.